Perspective View published in The Building News, May 30th 1873. The building was begun in the 19th century, and ended with completion of the nave after World War I. Built in the Gothic Revival style, and is designed to rival in size the medieval cathedrals of England that were lost to the Catholic Church through the Reformation. This magnificent ensemble of work the result of a mixture of the architectural talent of the late nineteenth and early twentieth centuries. The earliest part is the richly decorated transepts and masterplan by Dunn & Hansom, dating from 1873-1882. The choir is the masterpiece of Thomas Garner (who is buried there), dedicated in 1905. The soaring nave by Giles Gilbert Scott remains unfinished. The Lady Chapel is acknowledged as one of the most complete and successful schemes of Sir Ninian Comper, with a reredos and altar furnishings incorporating medieval fragments and a reliquary containing the skull of St Thomas de Cantilupe. The tower was completed in 1938 and is 166 feet tall. Downside Abbey has been designated by English Heritage as a grade I listed building. Perspective birds-eye view including ground plans published in The Building News, June 13th 1879. Perspective view of church published in The Building News, May 30th 1873. 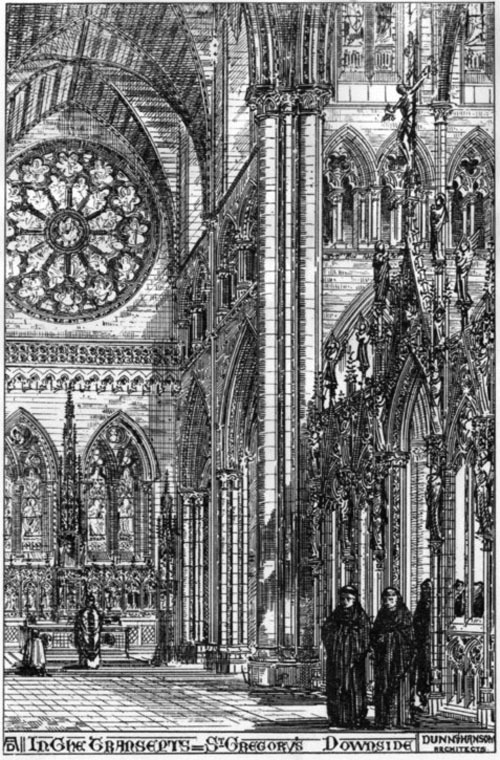 Internal view of church from October 16, 1874. 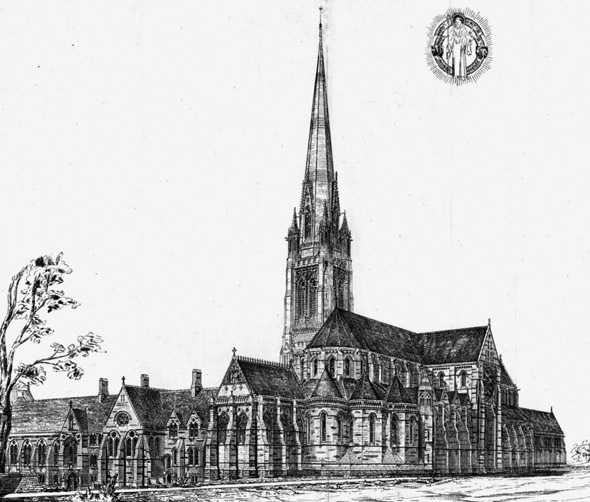 A double-page illustration of the exterior of this monastic church, designed by Messrs. Dunn and Hansom, of Newcastle-upon-Tyne, appeared in the Building News of May 3Oth, 1873, together with a description of the buildings, then just commenced. 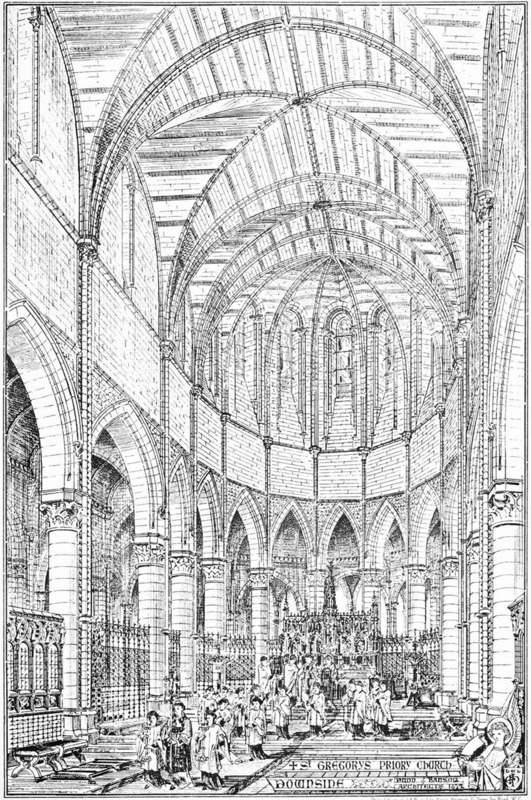 The present illustration shows the interior of the choir, which is 28ft. wide and 58ft. high. The whole will be carried out in Bath stone, except where coloured stone, &c., is introduced. It will be seen by referring to the plan published with the former illustration that the aisle is continued round the apse, from which open nine chapels. After the completion of the first contract, which comprised the foundations of “church” and of “west wing” of Monastery, the foundation-stone of church was laid by his Grace the Archbishop of Westminster on the 1st of October, 1873. The west wing is now being roofed in ; the cloister, in this part 153ft. long by 14ft. wide, is groined in stone. Mr. Joseph Bladwell, of Bath, is the contractor, and is also carrying out a part of the east wing and the kitchen offices.